As you drive along the Road to the Isles from Fort William to Arisaig and Mallaig it is impossible to miss the scattered community of Glenfinnan, largely because of the obvious presence of the Glenfinnan Monument at the head of Loch Shiel. It is, however, much easier to miss Glenfinnan Station, which lies towards the west end of the village, reached by a signposted minor road that climbs up the slope to your right if you are heading west. And missing Glenfinnan Railway Station would be a shame, because there is much more here than just a railway station, though you certainly find one of those as well. There is also a rather fine little museum, an excellent place to eat and drink, and some very unusual accommodation on offer. The railway station should be considered an essential stopping off point for anyone touring the area. If you are visiting by car, the recommended parking area is just above the junction with the A830, and you can walk the short remaining distance up the slope from there. Or limited parking (and disabled parking) is available at the railway station itself. Access is also, of course, available by train, though the infrequency of the standard service means that the only realistic way to have time to explore the station is by using the Jacobite Steam Train, the special service providing an 84 mile round trip between Fort William and Mallaig most days during the Summer half of the year, and twice daily at the height of the season. 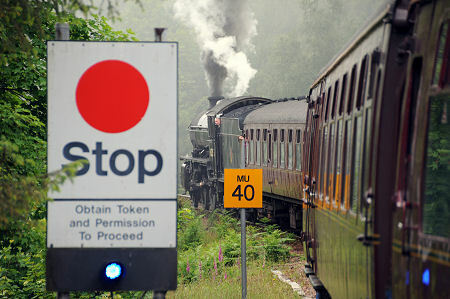 This is timetabled to pause at Glenfinnan Station for long enough to allow passengers a taste of what's on offer here. The railway first made its mark on the area a little over a century ago. The Mallaig Extension of the West Highland Line opened for business in 1901 and is generally regarded as one of the world's great, and most beautiful, railway journeys. Glenfinnan Railway Station stands a little to the east of the half way point along this line, and opened at the same time as the rest of it. The station itself is home to beautifully preserved examples of the sort of architecture typically used along the railway lines in the West Highlands, including a particularly fine main station building and a signal box in the sort of pristine condition seldom seen outside the wrappings of a brand new toy railway on Christmas Day morning. Simply in terms of the joy of taking a step back into time, the station at Glenfinnan is a great place to sit and watch time pass by. To the west the line curves and is soon lost to sight, while to the east of the station the views extend beyond the signal box all the way, on a clear day at least, to Ben Nevis, just under eighteen miles away. Not obvious from the station is that trains heading east from here curve round to the north before crossing one of the great wonders of the railway, the 21 arch 416 yard long Glenfinnan Viaduct, notable both for its concrete construction and its tight curve, which has the effect of allowing one part of a long train to be seen crossing the viaduct from another. 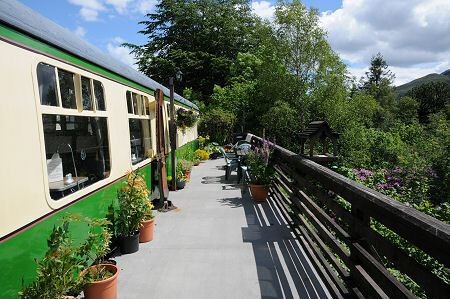 There are footpaths which link the village and the station with the viaduct for those wishing to take a closer look. The viaduct has increased in popularity as an attraction in its own right in recent years following its appearance in a Harry Potter film. The Glenfinnan Station Museum and West Highland Railway Centre, to give it its full title, can be found in the main station building. A modest admission charge is payable, which is in keeping with the scale of the museum itself. This occupies two rooms beyond the entrance area and shop, which between them tell the story of the building of the railway and provide a home to a range of artefacts which would once have been in use in ticket offices and stations along the line. 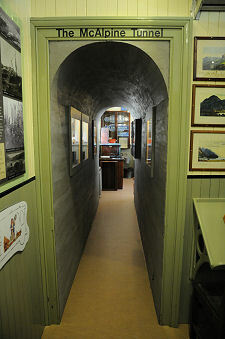 The two rooms are linked by "The McAlpine Tunnel", named after Sir Robert McAlpine, the builder of the railway. This is lined with an impression of the concrete finish applied to most of the structural elements of the railway. It's worth paying attention here. It was only on a second visit in the company of our grandson that we realised that the sounds of a steam train are piped into the tunnel. Young Alistair was utterly entranced, and very unenthusiastic about leaving. The museum was formed in 1991 to help preserve the station buildings, and you don't have to look very hard to see how successful it has been in doing so. The signal box is not open to the public (it is, after all, a signal box on a working railway). You can, however, admire it externally, and from here it is a few yards downhill to the station's resident snowplough, once attached to the front of engines to help keep the line clear.